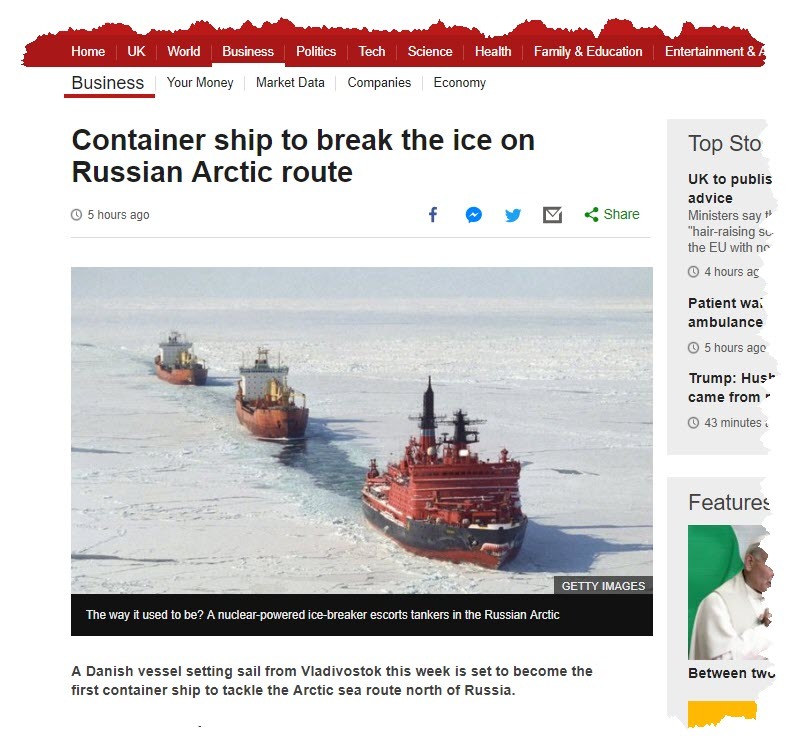 BBC Business News "Container ship to break the ice on Russian Arctic route". 21 August 2018. The Danish ship Venta Maersk, (Maersk Line, ice-class Baltic feeder vessel of 3,600 containers) is going to attempt to transit across the Kara Sea, the Laptev Sea and the East Siberian Sea. Maersk said: "The trial passage will enable us to explore the operational feasibility of container shipping through the Northern Sea Route and to collect data." 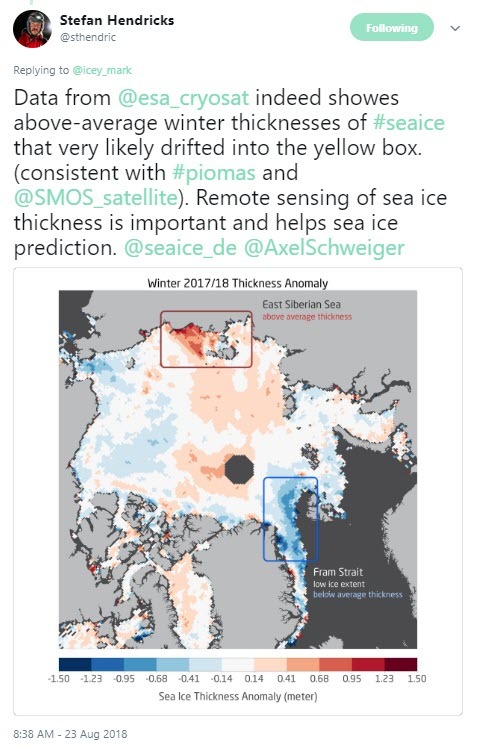 There is generally a lot happening in Arctic sea ice news at this time of the year as we head to the annual summer minimum extent, and current sea ice extent is currently about 1.6 million km2 below the 1981-2010 mean. Sea ice in the Arctic currently about 1.6 million km2 below the 1981-2010 mean. 21 August 2018. Annual Arctic minimum sea ice extent. Data from from NSDIC. we could expect the Venta Maersk to have potentially an easy passage. But that is rarely true in polar seas - even at the height of what will be the Arctic summer. A look at the distribution of the current sea ice extent is interesting. 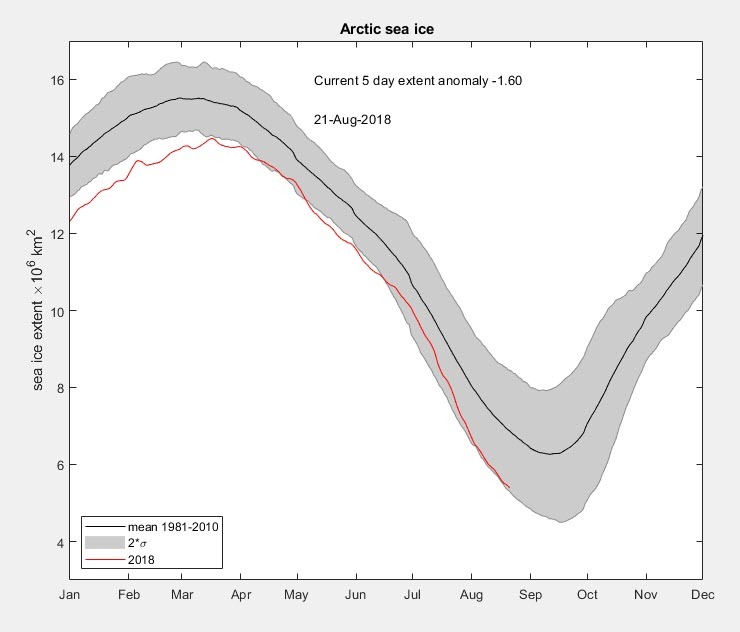 Arctic sea ice 21 August 2018, mean Arctic sea ice 21 August 1989-93 and difference between the two. 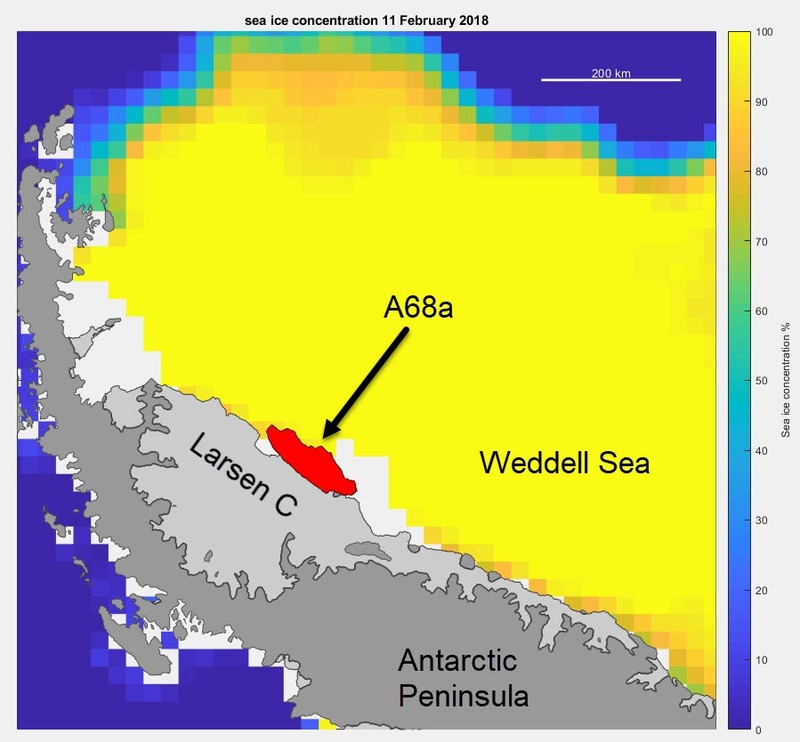 Reds indicate absence of sea ice compared to the older data and blues indicate increased. 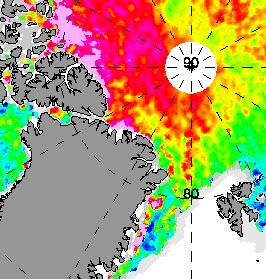 The yellow box indicates a region where there is much more sea ice than we could expect. There is more sea ice in the East Siberian Sea than we could expect (~40% more than the 1989-93 mean), and a look at the latest "near real time" (end of April 2018) ice thickness data from CPOM show that the ice in this region was quite thick at the start of the summer melt season. Arctic sea ice thickness processed at UCL from CryoSat's SAR mode data: NOTE THIS IS END OF APRIL 2018. NRT Service Suspended during Arctic summer (May-Sept). It is possible the Venta Maersk could find the going slow, but she is a polar rated ship designed to work in the Baltic, and by staying close to the coast she could avoid the ice completely. It is an interesting way to move a Baltic ship from it's build location in China to its planned operational area, and one to watch over the next month. 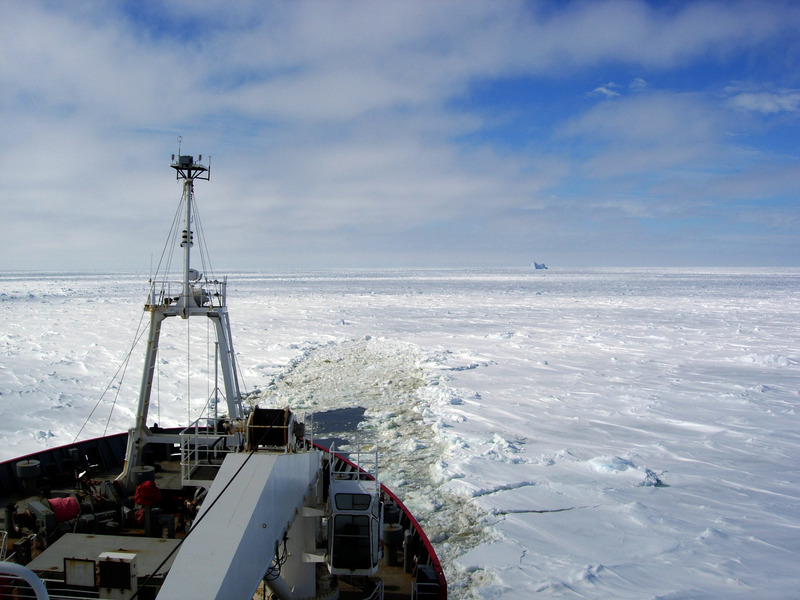 The excellent researcher Dr Nathanael Melia wrote a great post about the potential of Arctic Shipping on Carbon Brief in 2016: What will sea ice loss mean for Arctic shipping? Interestingly if you look at the Cryosat sea ice thickness map north of Greenland you can see that at the end of the winter the sea ice thickness was already relatively low. (See the story in the Guardian: Arctic’s strongest sea ice breaks up for first time on record). 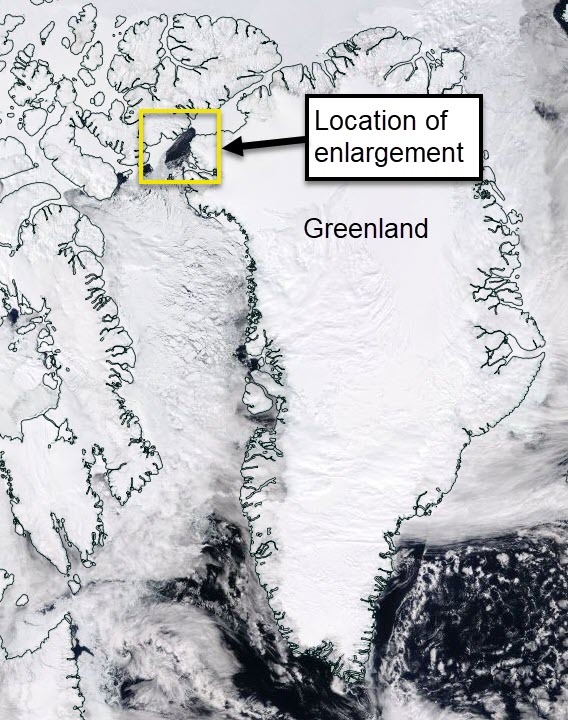 The thickest sea ice is further to the west north of the Canadian Arctic Archipelago. Tweet from Dr Stefan Hendricks. From Dr Ruth Mottram at the Danish Meteorological Institute. Tweet from Dr Ruth Mottram. Posted in Science. Tags: Arctic, Maersk, Northern Sea Route, sea ice, ship on August 23, 2018 by Mark Brandon. I love watching the opening of a polynya in satellite data. This is North Water at the NW tip of Greenland expanding over 6 days. You can see the wind is to the SW and it is both pushing the mobile sea ice away from the fast ice of Nares Strait (the strait is named for George Nares), and the growth of new sea ice. The Opening of North Water 9-14 May 2018. This is the location of North Water. It is a famous polynya and important for the local wildlife and first peoples. The location of the polynya region. The image below from the 14 May 2018 shows streaks of frazil ice. 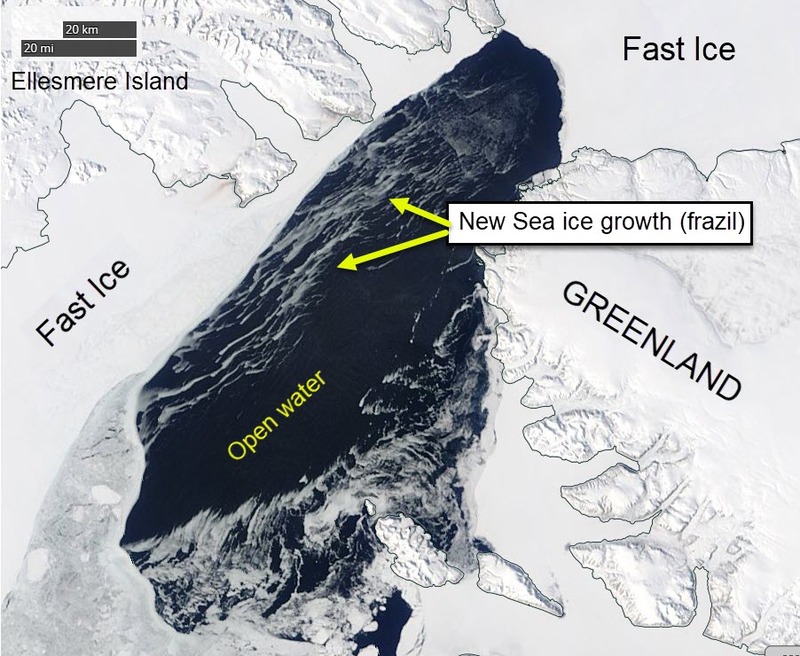 So what you can see is as well as the wind pushing the sea ice away from the fast ice, new sea ice is being generated. North Water on the 14 May 2018 showing frazil ice streaks. One to watch in the next week. Posted in Science. Tags: Arctic, frazil ice, Greenland, MODIS, Nares Strait, polynya, sea ice on May 17, 2018 by Mark Brandon. This is a MODIS image from 2004, but it's too good not to post here. I'm giving a talk tonight for the South Georgia Association called Giant Icebergs and South Georgia, so I'm wandering through a lot of these images at the moment. South Georgia is a small island approximately 190 x 30 km within the Antarctic Circumpolar Current in the South Atlantic. It has a continental shelf that extends more than 50 km from the coast with average depth ~200 m, although there are deeper submarine canyons. A38 is about 300 Gt in mass, so it's really significant. The work I was doing on this was picked up in 2010 by the BBC in a story called Giant icebergs head to watery end at island graveyard. Posted in Science. Tags: A38, iceberg, MODIS, South Georgia on April 20, 2018 by Mark Brandon. Being interested in the Weddell Polynya I plotted some time series data from 1 September 2017 to 23 November 2017. On the left-hand panel, you can see the see the sea ice concentration, on the right-hand panel, the anomaly of the concentration each day compared with a mean from 1989-93. 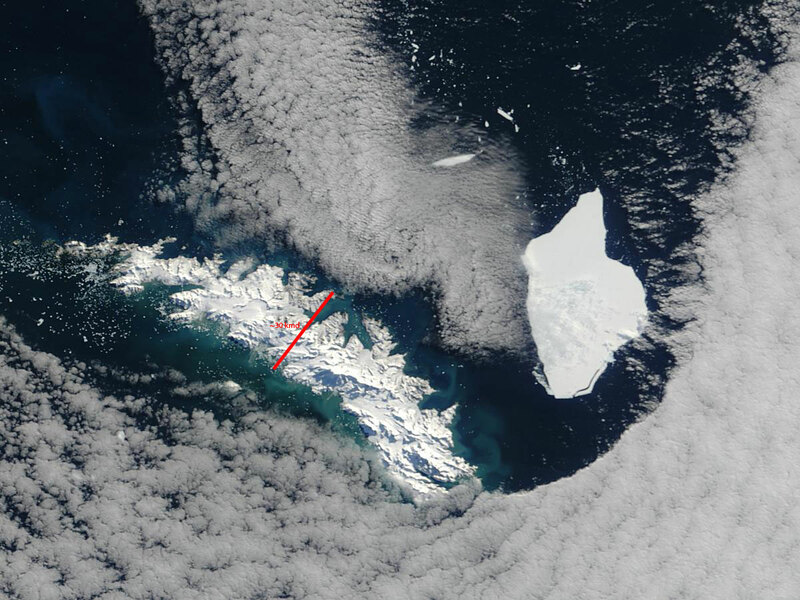 The Weddell Polynya is the low concentration region at approximately 12:00 in the movies below. You can see the Weddell Polynya isn’t stationary. You can also see the sea ice is still relatively low compared to the historic record. We should expect this after the extreme low sea ice from ~October 2016 onward. Antarctic sea ice extent (with greater >15% sea ice cover) 23 November 2017. From NSIDC. 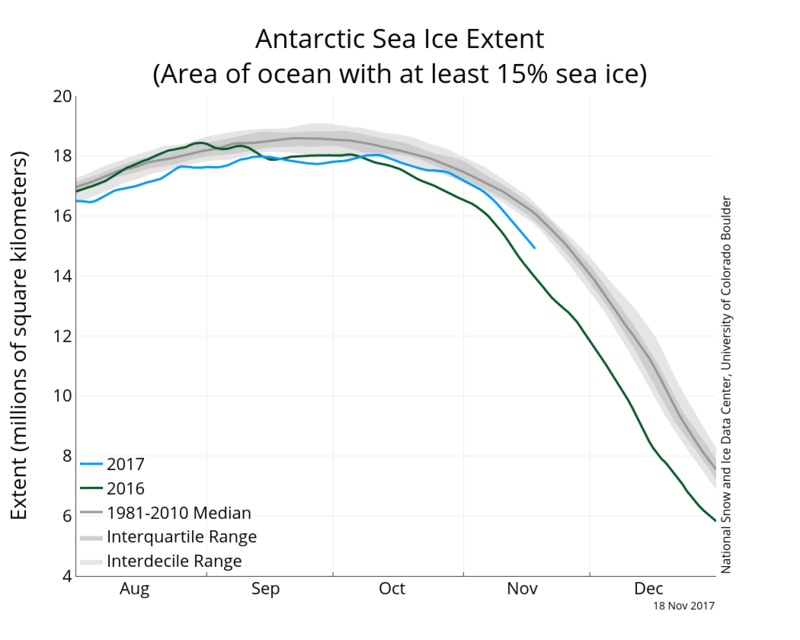 I will write some more about this next week but for interest here is the Antarctic sea ice extent anomaly for 2017. I made these movies using the excellent Antarctic Mapping Toolbox by Chad Greene. Antarctica is the Landsat Image Mosaic Of Antarctica (LIMA), and the coastline and shelf outlines come from the BEDMAP2 data set. 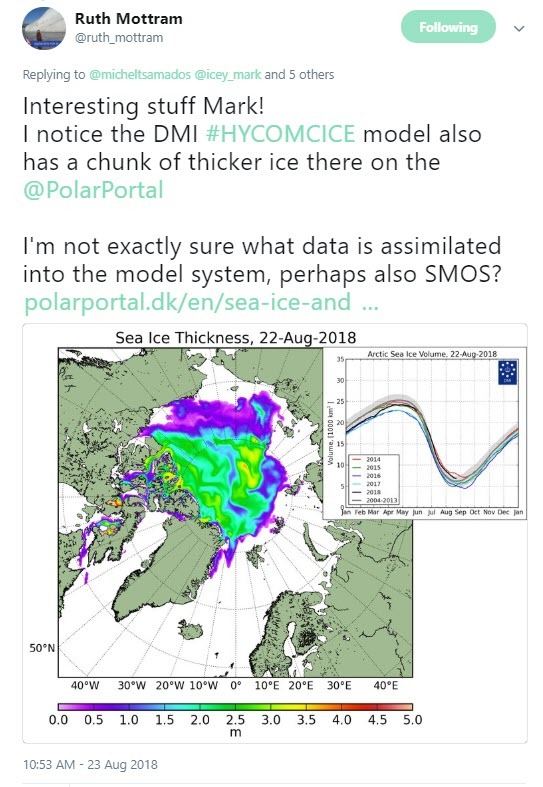 Sea ice data is from NSDIC. Posted in Science. Tags: anomaly, antarctica, sea ice, Weddell Polynya on November 24, 2017 by Mark Brandon. 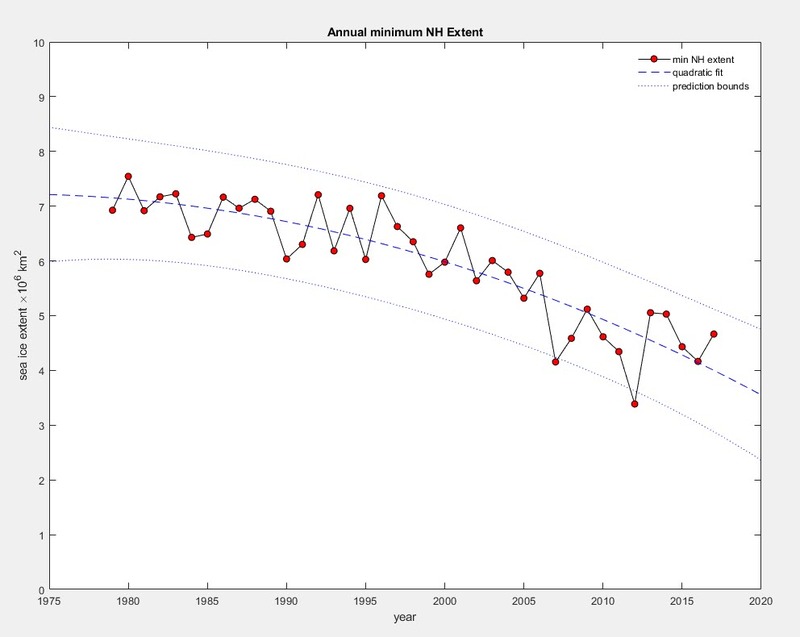 Antarctic sea ice extent remains low compared with the 1981-2010 median extent. This image shows the mean from 1989-93, the extent on 20 November 2017 and the difference between the two. 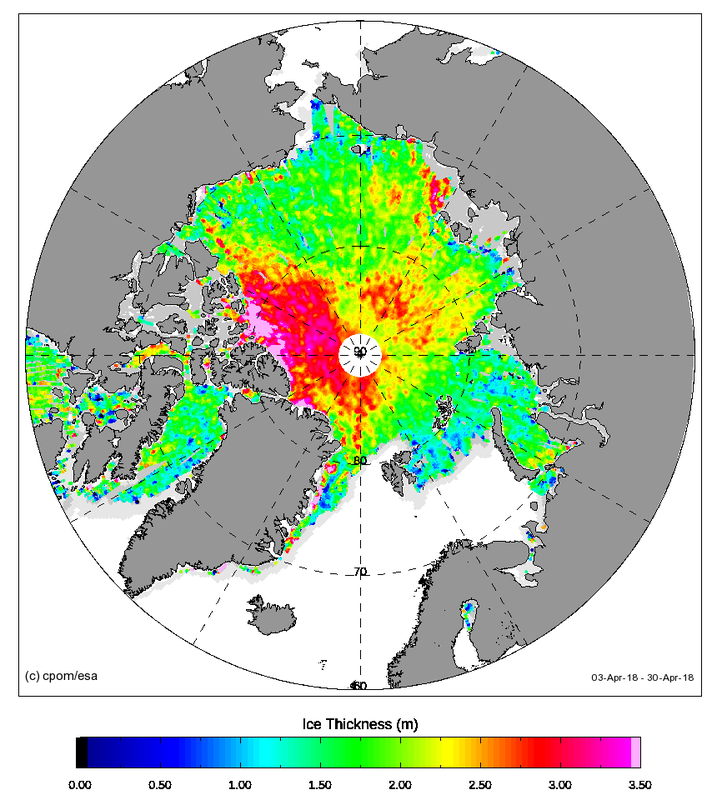 Red colours imply that there is a decreased sea ice extent compared with the mean. The mean Antarctic sea ice for the years 1989-93 on 20 Nov, the sea ice concentration on 20 Nov 2017 and the difference between the two data sets. Reds imply decreased sea ice compared with the mean, blue shades imply more. The original data come from the DMSP SMMI data set at the NSIDC. 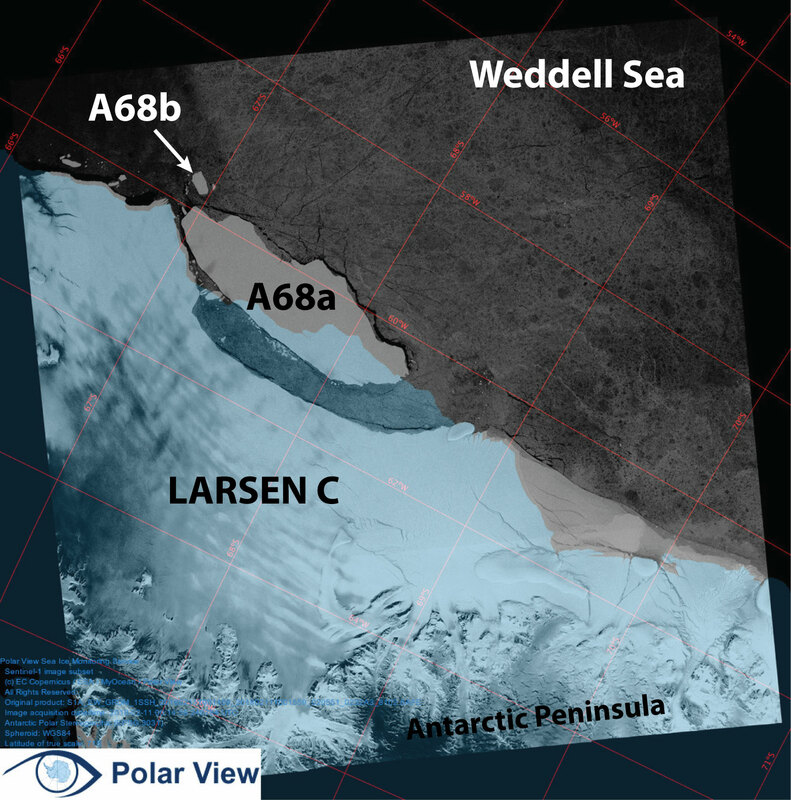 And obvious low region is the vicinity of the Weddell Sea Polynya. I have written about the polynya this season on 17 September and 25 September, as well showing how it developed through the winter on 11 September 2017. 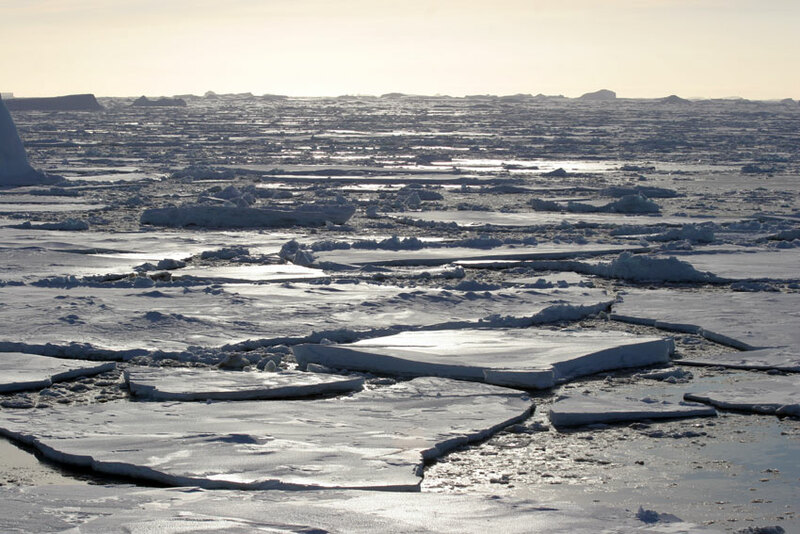 Last month, SOCCOM scientists were astonished to discover that a float in the Weddell Sea had surfaced inside the polynya, making contact with satellites in the dead of winter. 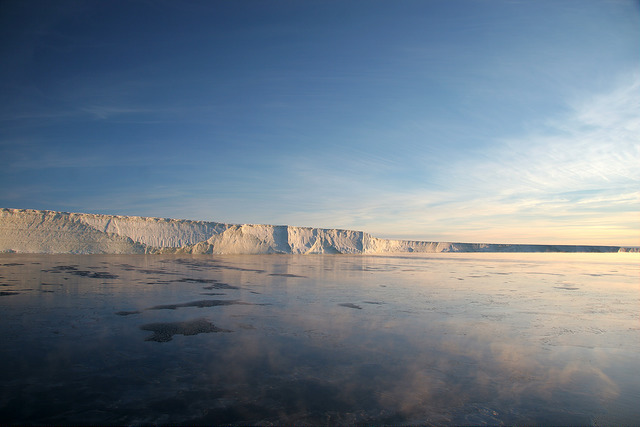 Its new ocean measurements, transmitted when it surfaced, are being analyzed as part of a study in preparation on Weddell Sea polynyas. With these new observations comes the possibility that the polynya’s secrets may finally be revealed. We should expect some exciting research articles soon. The overall sea ice extent is currently ~1.2 million km2 below 1981-2010 median extent. This sounds a lot. Antarctic sea ice extent (with greater >15% sea ice cover) 18 November 2017. From NSIDC. 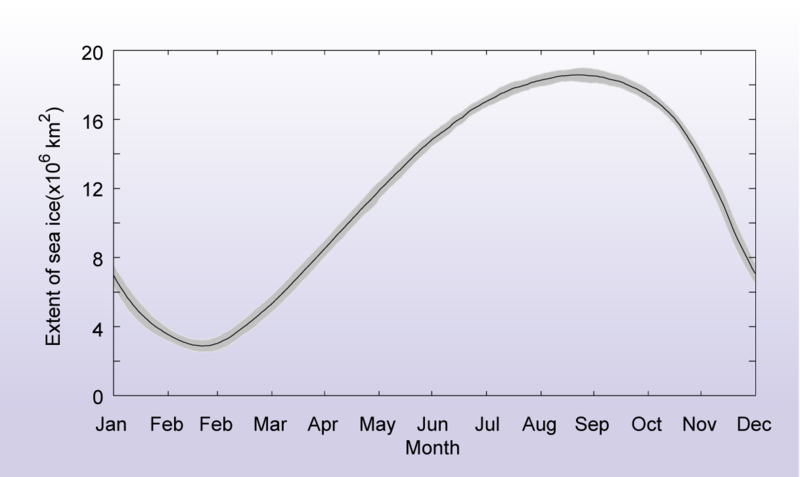 But at this time of the year the Antarctic sea ice is about to dramatically fall as spring develops. If spring "arrives" early then the extent will - as we see, be relatively low. Whilst the full on development and opening of the Weddell / Maud Rise Polynya is unusual, if you compare the sea ice on 18 November 2017 with the extent from the same day on 1989-1995 it is clear that the extent is often lower over Maud Rise, at this time. This is the sea ice on 18 November for 1989, 91, 92, 93, 94, 95 and 18 November 2017. The original data come from the DMSP SMMI data set at the NSIDC. MODIS mosaic from the AQUA satellite on 18 November 2017. ** UPDATED 20th November 2017 replacing the first figure from 17 November to 20 November. Posted in Science. Tags: antarctica, extent, Maud Rise, sea ice, SMMI, Weddell Polynya on November 20, 2017 by Mark Brandon. With three of my Open University colleagues: Dr Phil Sexton, Dr Pallavi Anand, and Dr Mandy Dyson, I have been working in the background on a new landmark TV series called Blue Planet 2. This incredible series has been made by the BBC Natural History Unit with the Open University as co-producers. It has seven stunning episodes and will be broadcast in the UK at the end of October 2017. Yesterday was the World Royal Premiere at the BFI Imax with Sir David Attenborough, Prince William, Radiohead, Hans Zimmer, and a team of BBC program makers that is too long for this post. The prequel above was released after the premiere. Sir David Attenborough, James Honeyborne, Orla Doherty, Mark Brownlow and Hans Zimmer. 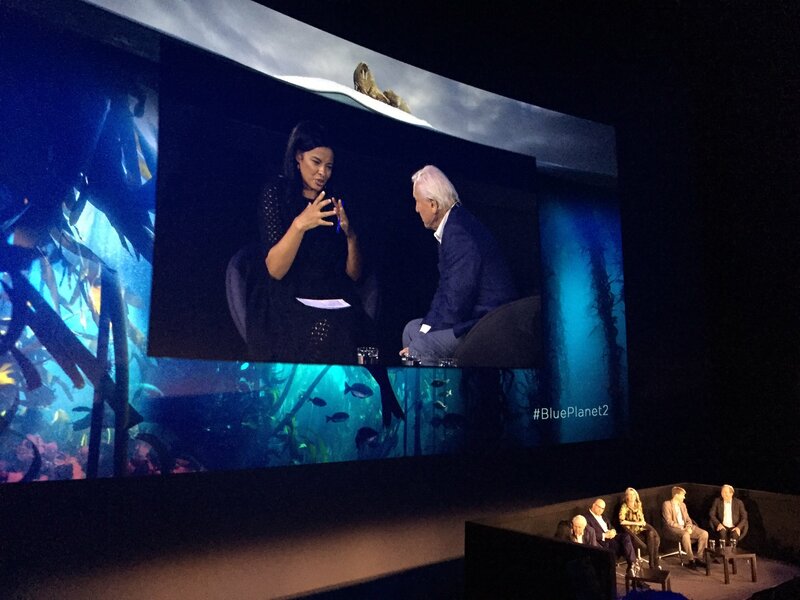 Liz Bonnin interviewing Sir David Attenborough After the World Premiere of Blue Planet 2. It's been a brilliant experience to work with so many incredible film makers - many of whom also have PhDs to go with their artistic and technical talent. You often hear about how the media want to tell their own story - but in my experience the NHU just want it to be the best - and, of course, correct. I'm proud to have been a small cog in the mighty and incredible machine that made this series, and I'm looking forward to seeing how it is received. It has been an amazing experience to be one of four marine scientists at The Open University to have contributed to the series. As well as helping the production team we've been developing interactive learning materials and a poster for the general public and our students that will also be released at the end of October. I hope the film makers get the awards I think they deserve for making such a powerful work. Posted in Personal, Science. Tags: Blue Planet 2., oceanography on September 28, 2017 by Mark Brandon. 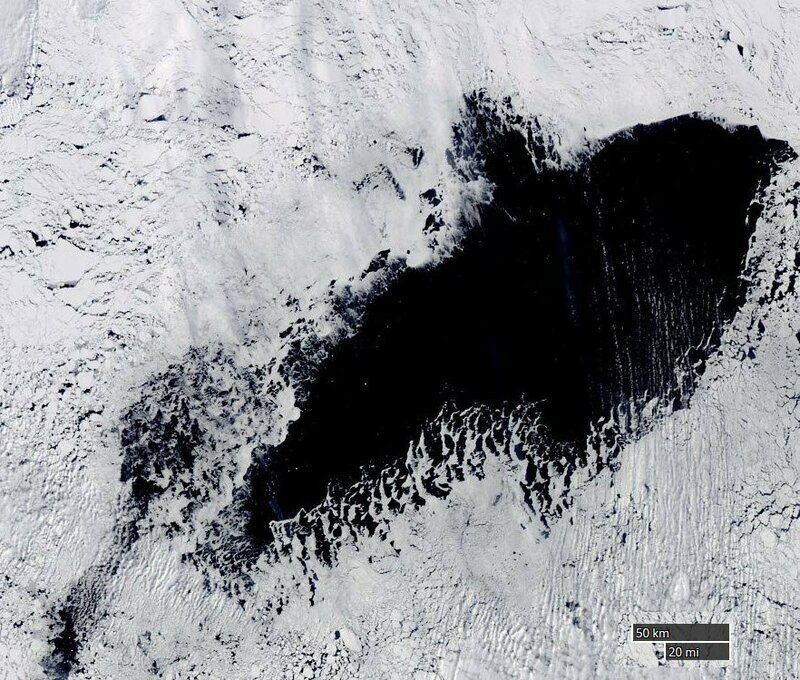 The polynya over Maud Rise was visible in a beautiful clear MODIS image on 25 September. It is currently ~40,000 km2 of open water in the middle of the Antarctic winter sea ice. This will be some impressive heat loss. MODIS image of the polyna over Maud rise on 25 Sept 2017. The black is ~40,000km2 of open water. 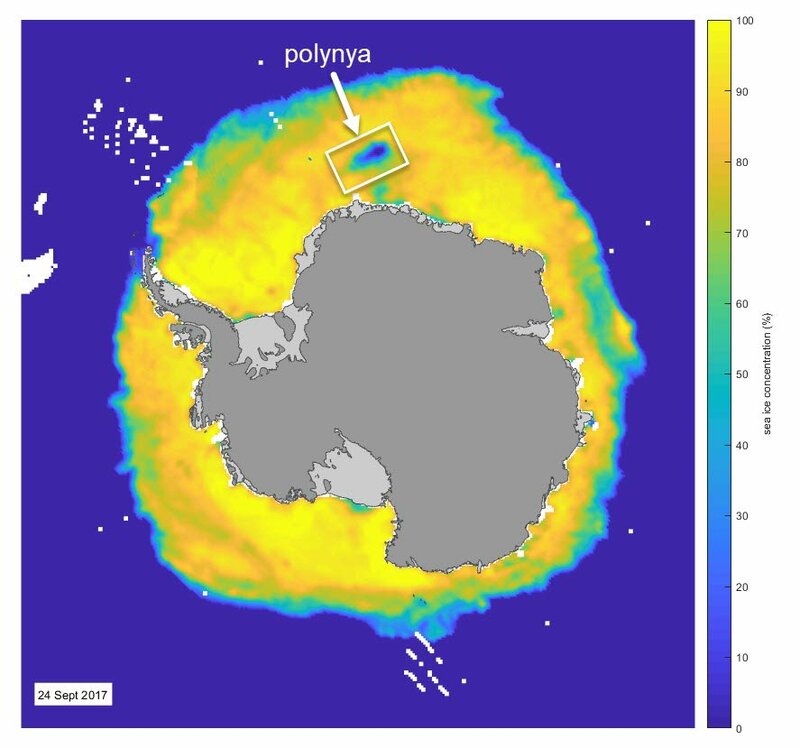 This is the polynya in the SMMI Data for the same day. 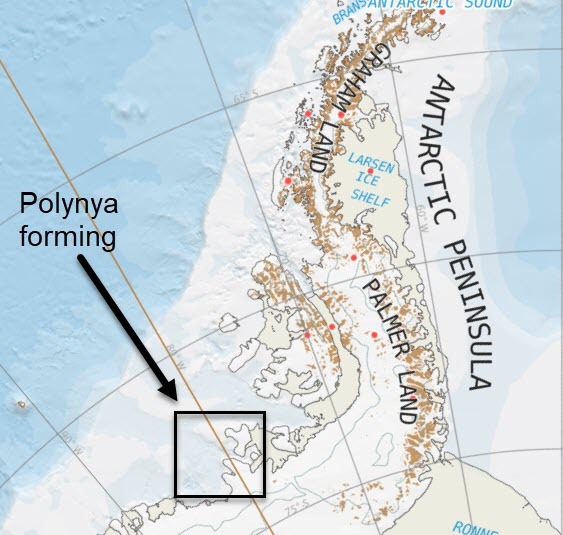 Location of Maud Rise polynya 25 Sept 2017. More to come on this I expect. Posted in Science. 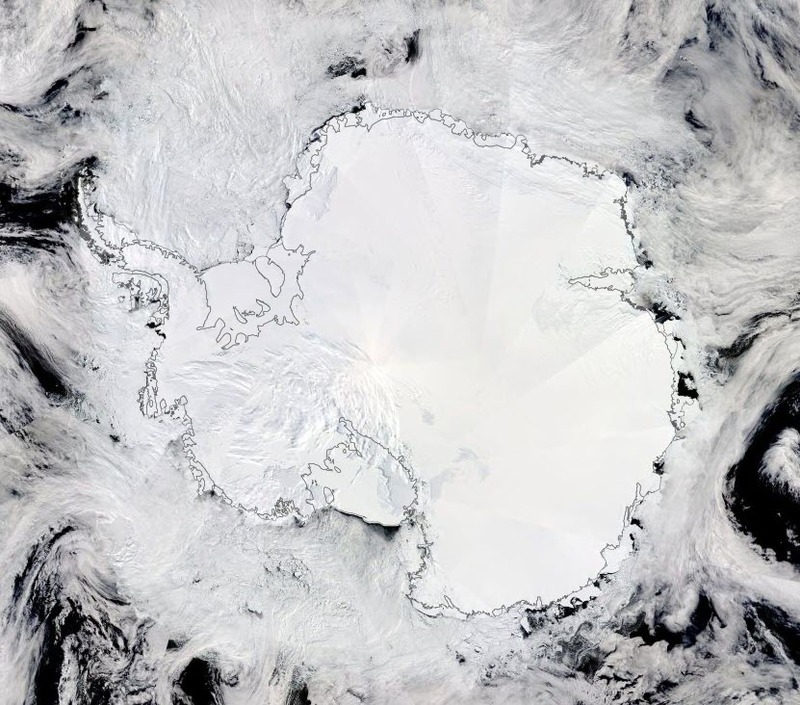 Tags: antarctica, Maud Rise, polynya, Weddell Sea on September 27, 2017 by Mark Brandon.